I like to consider myself an adventurous eater but there are some things I still have to mentally prepare myself to eat. These include snails, frog legs, uni, liver and oysters. I admit, raw oysters still give me the huzz and closing my eyes seems to be one way to eat the gooey slime staring back at me from a half shell. 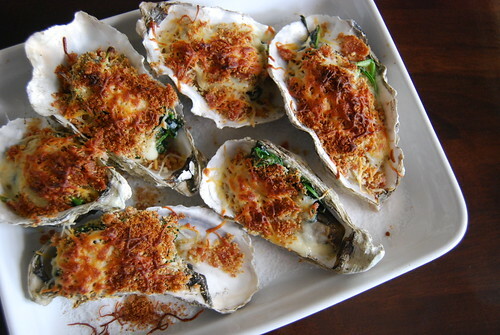 But Oysters Rockefeller is an entirely different creature on its own. First it’s parboiled, then topped with cheese, spinach and breadcrumbs before going under the oven until the cheese melts and the bread crumbs are toasted. Melty cheese and oysters are delicious! Research shows that it was named after John D. Rockefeller in the late 1800s by Jule Alciatore who took the recipe with him to the grave. So the recipes floating around are just estimates of what it really includes. But the version I’ve had and also made during my preblogging days have always included spinach. For the uninitiated oyster buyers, always buy shells that are closed to ensure a fresh product. Boiling them in water helps to open them up. And while you may not have absinthe to include in the boiling water (its only been legal in the U.S. the last few years), your favorite beer also works pretty well. In a large stock pot, heat water until boiling. Add absinthe (or beer) with oysters to boiling water. 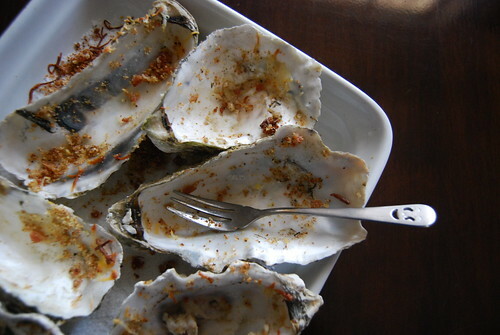 Cook for 10-15 minutes or until oysters are slightly open. Drain and cool. Heat over 450 degrees F.
In a pan, fry bacon until crisp. Drain on paper towel and roughly chop. Discard half the bacon fat and in same pan, add spinach until slightly wilted. In a small bowl combine bacon, parmesan and fontina cheese, bread crumbs and garlic. Set aside. Crack open uslightly cooled oysters, leaving meat on concave half shell. 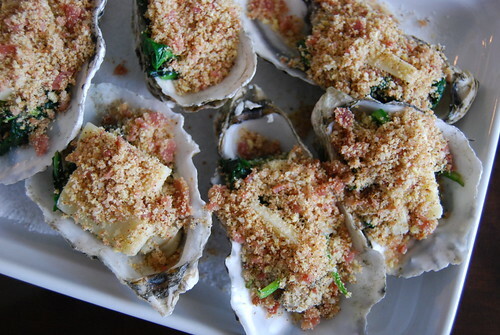 Arrange shells on shallow rimmed baking pan and evenly divide spinach and cheese/breadcrumb mixture on each. Sprinkle a bit more cheese on top if desired. Bake for 20 minutes or until thoroughly heated. Serve with hot sauce. Wow! These look amazing! Where do you like to buy seafood in San Diego? In the past, I’ve bought them from 99 Ranch in Kearny Mesa but for the absolute best, I would go to Point Loma Seafoods. Thanks, Darlene. I like 99 Ranch but haven’t tried Point Loma Seafoods. Thanks for the tip! Oh my gosh, YUM!! I love having oysters during the holiday season. Usually just with a dash of hot sauce and a squeeze of lemon. This looks delicious though. I’m slowly working my way up to just adding lemon and hot sauce but until then, this is my favorite way to eat oysters. Baked shellfish + cheese = yummy! PS – I love your little bitty fork with the smile. Glad you noticed the detail in the fork! Happy NY to you and Paul. I need to be in a cookie exchange with you next year! PS. THought of you in Portland, crazy donuts galore!!! Ooh that’s pretty neat! I don’t think I’ve ever tried oysters this way but it does make the thought of COOKING oysters sound more feasible! Thanks for sharing this!